Sober Look: Would you deposit your money at JPMorgan Chase or Credit Lyonnais? Would you deposit your money at JPMorgan Chase or Credit Lyonnais? Reuters: Standard and Poor's reduced its credit ratings on several big banks in the United States and Europe on Tuesday as the result of an overhaul of its ratings criteria. A few surprising results: Most US and UK institutions got their ratings reduced by one notch, while ratings for firms like Deutsche Bank, Societe Generale, Credit Agricole, BNP Paribas, and Credit Lyonnais were left unchanged. What changes in the methodology would explain this? 1. 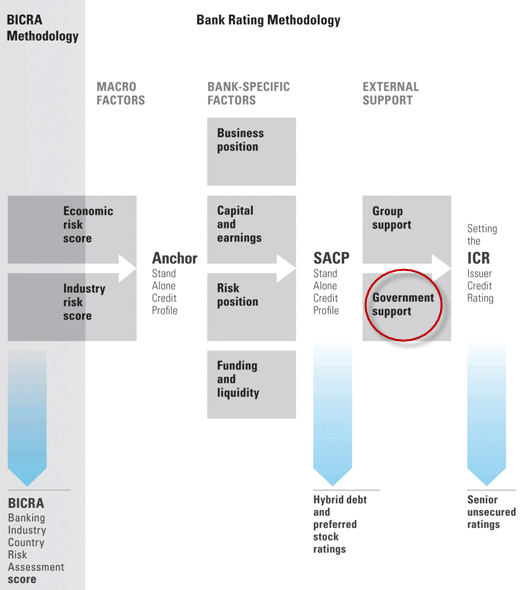 Macro: the rating agency is focused on how strong the banking business is in that country. Is the economy reasonably strong, how creditworthy is the sovereign where the bank operates, how good is the regulatory framework, how strong is the private sector, etc. 2. External support: how much is the government of that nation willing to do what the Fed and the US Treasury did with the banking system in the US in 08/09? So according to the S&P, because France and Germany are rated higher than the US based on the combination of the above criteria, there is a downward adjustment to the US firms. The US sovereign rating is lower, the economy is slow, the regulatory framework is getting worse, and the government is no longer willing to support the financial system in a crisis (in a way that say Germany, France, or for that matter Japan or China are willing to do). This all makes sense, but should Credit Agricole, Credit Lyonnais, and Deutsche Bank really be A+, while JPMorgan Chase be A? With the eurozone crisis raging, here is a simple question - would you deposit your money at JPMorgan or Credit Agricole?